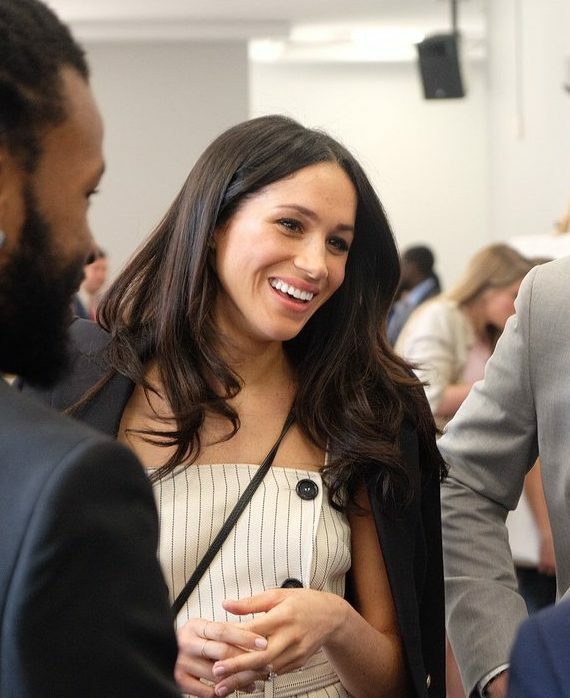 Today Prince Harry and Meghan Markle attended the Youth Forum Reception for CHOGM. Meghan was spotted in a stripy ensemble adding to two Australian designers to her look. Meghan wore a dress by Altuzarra, the ‘Audrey’ belted striped midi dress, retailing for £1,450. More of a pinafore style dress, the Audrey is made from an ivory twill with a thin black pinstripe, a double breasted bodice, with single buttons down the hemline with slight slit. The dress also has adjustable thick straps, buckle belt to cinch in the dress and diagonal flap pockets. This Joseph Altuzarra dress was inspired by 1980’s corporate dressing as a part of the Resort 2018 Collection and also comes in a black colour-way and longer sleeve shirt dress. Unfortunately this dress is a huge ‘no’ from us today and we are normally champions of Meghan’s style and look. Just add a straw sun hat, oversize sunglasses and a pair of flat sandals for a day at the beach, perhaps save this one for the honeymoon? We think this dress is not formal enough of a soon to be senior Royal and the type of engagement that Meghan was attending. You can purchase Meghan’s dress at numerous retailers including here, here, here, here and here. You can get an amazingly affordable version of this dress here. Meghan wore the ‘Marguerite Blazer’ by Australian designers Camilla and Marc, retailing for around £389. This is a very structured blazer style, with a single-breasted front featuring two signature Camilla and Marc gold buttons and three buttons on each cuff sleeve. The blazer features seamed panel detail meeting in to a cinched waistline that slightly flares to give a peplum feel to the rear of the blazer. Padded shoulders, front side flap pockets and a fully line interior complete the styling of this blazer. A very nice piece added to Meghan’s wardrobe that we hope to see again. Meghan draped this blazer over her shoulders, in a very hollywood and fashion girl way to wear a blazer. The two gold toned buttons are very reminiscent of the ‘Duchess’ Blazer style by Smythe that The Duchess of Cambridge has worn before. Camilla and Marc are a mid range designer label in Australia – think McQ by Alexander McQueen. The label was founded in Sydney by brother and sister Camilla Freeman-Topper and Marc Freeman in 2003. Australian women’s must have piece by the label is the famous C&M tank t-shirts. You can purchase Meghan’s blazer here. We have found you a great get the look blazer for less here. Stylist’s Buying Tip – if you are out and about and stumble upon a blazer that is like Meghan’s but only has black buttons instead of gold ones, don’t worry at all! Purchase it, cut off the black buttons, go to your local haberdasher and find some gold buttons, sew them on in place. You can actually cut the buttons off any of your garments and change them up. Adding pearl buttons to a boring work shirt can change it to elegant feminine chic and make your work shirt look very expensive! Meghan carried the ‘Avalon’ zip top cross-body bag by Oroton, costing £161. The cross-body style is a favourite of Meghan’s, so this perfect bag for her. The ‘Avalon’ features a zip top/magnetic closure, leather pebble in a mix of blocked black and white stripes punctuated with thiner stripes. The interior is lined with a cognac pebble leather and has slide slip pockets, a hanging pocket and gold hardware accents. The bag features a detachable strap to convert the bag to an evening clutch. This is another Australian designer whom we saw The Duchess of Cambridge carry on her visit to Australia. Kate chose the Oroton ‘Odeion’ clutch in blue, to match her LK Bennett blue poppy print dress. Oroton was rumoured to be going into administration earlier this year, with the luxury label said to be having a massive fire sale to try and save their business. However, they did not go out of business and we can only think that Meghan carrying this bag will help to bolster sales of this company. This bag also comes in a rust/blue colour-way and solid red colour-way. You can purchase Meghan’s bag here. Get a nice affordable version of this bag here. Meghan wore a pair of ‘Paramour’ heels by US California based designer Tamara Mellon. These heels retail for £334. An almond toe shaped pump in black suede with 105mm stiletto heel (!) and two gold buckle adjustable straps one across the front of the foot and one at the ankle. These heels are also available in Marigold. Mellon is a favourite designer of Hollywood celebrities with her shoes often seen on the red carpet with celebs opting to wear the ‘Frontline’ style. We have found you an absolutely affordable get the look style (with slight block heel) purchase here. Meghan wore her Birks ‘Les Plaisirs De Birks’ gold bar earrings, retailing for £264. These are a very simple but classic earring style that can be worn with any outfit, day or night for years to come. These gold bar earrings are a favourite of Meghan’s having been worn on numerous occasions. You can purchase Meghan’s earrings here. Get a very affordable pair of these earrings here. Meghan accessorised with three of her rings. She wore two of her Catbird NYC ‘Threadbare’ rings £40 and her new Vanessa Tugendhaft ‘Infinie’ ring £1123. She has worn this ring combination to her last three engagements. You can purchase Meghan’s Catbird rings here and get a very affordable get the look style here. You can purchase Meghan’s Vanessa Tugendhaft ring here. Get a nice get the look of the infinie ring here. Meghan also wore 3 bracelets on her wrist, a thin gold band, a chain and an open ended bracelet with what appear to be inlaid with Opals. We will update you with more details when we know more about these pieces. You can purchase a great get the look for the open ended style here. Copy Meghan’s thin gold band style for less here. Toady we feel that Meghan’s style was much more Hollywood starlet than royal lady, perhaps the quick trip back to Chicago reignited the actress style?